Everything started with me four years ago when I wanted to satisfy my curiosity of how deep the human body can go, from this question I started to approach the answers, I was researching in books and on the internet but still never had the absolute answer so I figured out the best way to find the answer is to try in myself, from here everything started. At the beginning it was so difficult because the cost of this project needs lot of money regarding to logistics and different people experiences in so many fields to expand my comfort zone on the way down and also my way back up again, of course I met lots of people was interested but some of them didn’t believe in what I’m doing so they were just trying to use the situation got their own benefits and agendas. I finally found the right people in Dahab town in the South of Sinai and they all were working heart and soul with me to fulfil the project, they believed in me, they used all their previous experiences to get the depth mission done and they were always asking me why I’m doing that? My answer was if you want to wait for someone to open the door for you then you have to keep waiting for the rest if your life and the door will be always closed. 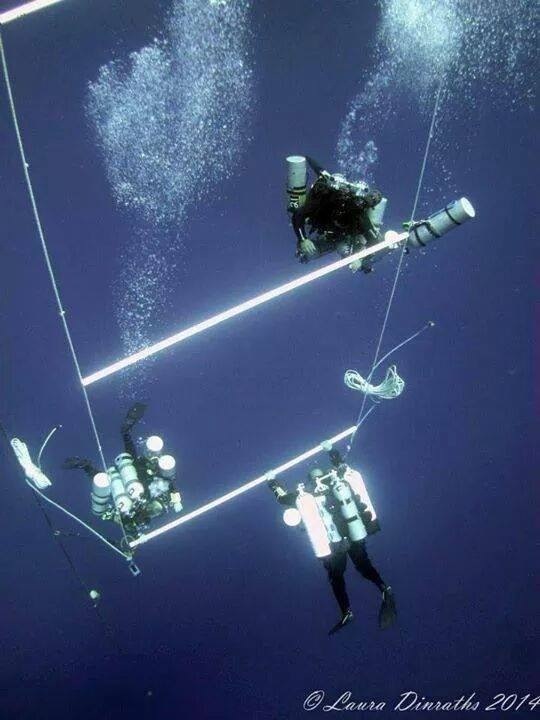 In the last year we finalized our plan and we selected the gasses the matches these depth to avoid the main pathologies in out dive which was oxygen toxicity, decompression sickness, high pressure nervous syndrome and isobaric counter diffusion and we started to test the selected gasses in shallower depth. We modified some if the gasses and at the end we decided on the record gases, it was never a one man decision, it was always a team decision. I felt happy and comfortable and my comfort zone started to be bigger and bigger specially when we got sponsors for the event. 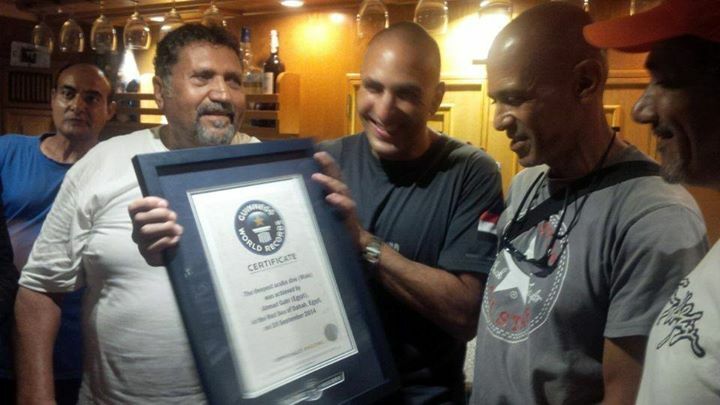 My descent took me 14min,and I grabbed a verified tag by Guinness world record adjudicator and other expert witnesses, we had about twelve witnesses from different organizations and technical diving and commercial diving experts and also the Guinness world record adjudicator to verify the dive. 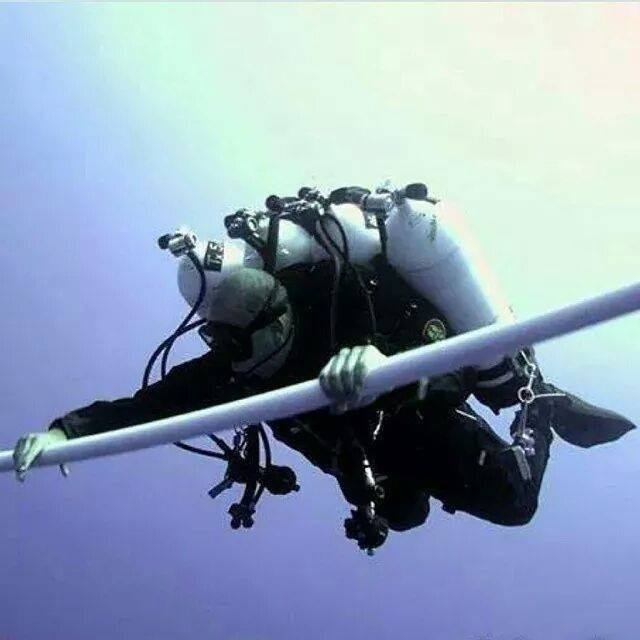 My ascent lasted for 13 hours and 50 minutes for decompression, I had a baby oceanic white tip shark as company for 6 hours, I think he wanted to say congratulation. After I surfaced I got checked by the medical team that confirmed that I’m absolutely fine and I just had a bit of dehydration, they followed up with me for 72hours after the dive and everything was perfect. My experiment is done but I will never stop. 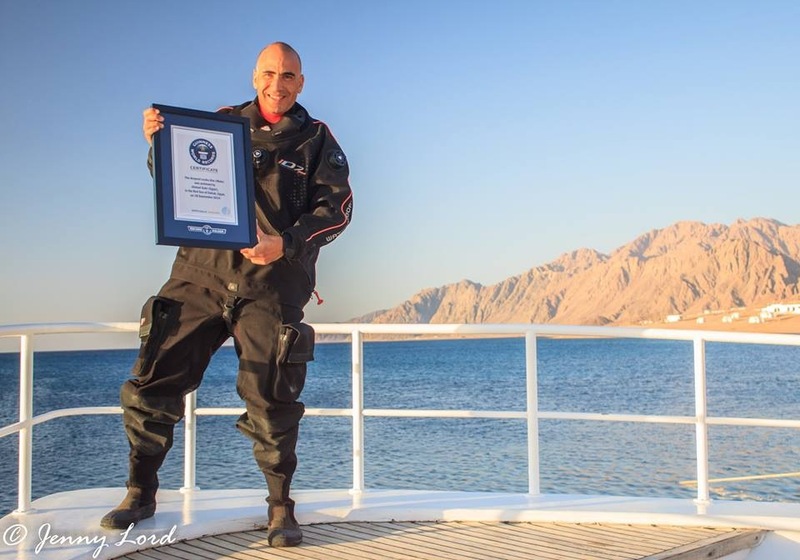 This entry was posted on Thursday, October 16th, 2014 at 6:26 pm	and is filed under Ahmed Gabr, Guinness World Depth Record, Pro Diaries, Rebreathers, Scuba Diving Depth Record, Scuba_News, standards, Teach First Aid/CPR, Tec, Tec Diving, Technology, TecRec, TecRec IT Crossover, UW Photography, Wrecks. You can follow any responses to this entry through the RSS 2.0 feed. Responses are currently closed, but you can trackback from your own site.